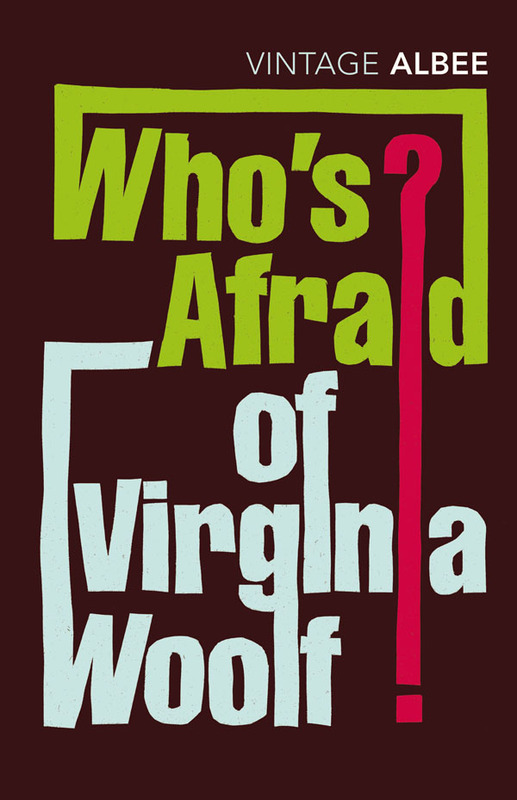 Initially, all I could think during and after reading Who’s Afraid of Virginia Woolf, a 1962 play by Edward Albee, was “What the hell?” George and Martha, a long married couple, return home from a university faculty party and the sparks begin to fly…sparks that are definitely not of the good variety. 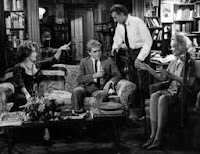 George and the reader learn that the young new biology professor, Nick, and his wife, Honey, have been invited over for some post party cocktails by Martha. It is after two o’clock in the morning and George is pissed. More sparks fly and the fighting continues to escalate right in front of the company. These two were making me incredibly uncomfortable, to say nothing of Nick and Honey. By the end of the play, the situation has gotten completely out of hand. I went from initially thinking that George and Martha were just acting like loons because they were drunk to thinking that perhaps they (or at least Martha) were mentally ill. I was so distracted by their behavior that I originally missed much of the symbolism and intention of this work so, I actually had to give this play some extra thought. 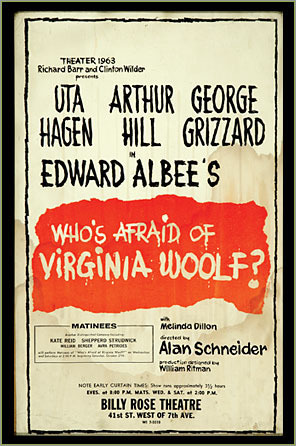 Albee certainly succeeded in creating an interesting character study. I would really like to see this on the stage. I think that it is important to remember that this play was originally being viewed by individuals who were just leaving the warm clutches of the wholesome 1950s. A time when shows like Leave it to Beaver depicted the "white picket fence" American family on TV. A world where everything was all “golly Wolly” and “geez Beav” and June and Ward were all smiles even during the rare disagreement. Albee was perhaps trying to expose this as a façade. That many Americans did not necessarily have their polite “telephone voices” turned on all the time. That life was gritty, complicated and imperfect and that for those that were hiding behind the facade ultimately illusion was a dangerous game. Albee is scrutinizing not only how some people project false images in public but also how this occurs in more intimate relationships such as between husbands and wives. Albee also explores how the frustration of the lack of children, the lack of career success for a man, and the unavailability of career options for women during this time can affect marriage. The image of the ideal successful American family required that certain expectations be met. A family required the perfect working dad, house wife and mother, children, house, and car. One must keep up with the Jones next door. This play reminded me in some ways of Richard Yates’ novel Revolutionary Road which is a haunting tale of the dangers of chasing the idealistic American dream. I think it would be interesting to explore these two works together in an upper high school English class. Ultimately, I think this play is something that must be experienced live rather than read. Labels: Edward Albee, Revolutionary Road, Who's Afraid of Virginia Woolf? Yes, most plays need to be seen, and reading afterwards for further nuances. I agree that this needs to be read in light of the period. It's absolutely a commentary on the dissolving saccharine (by appearance at least) times. rotate my blogs again and again having a preset time interval. And in addition I'd like to shuffle my posts. Would RSS feeds get the rotated blog posts as new ones? Does someone have this PHP code? Thanks.